Jeff Schumer is a long time member of our league. 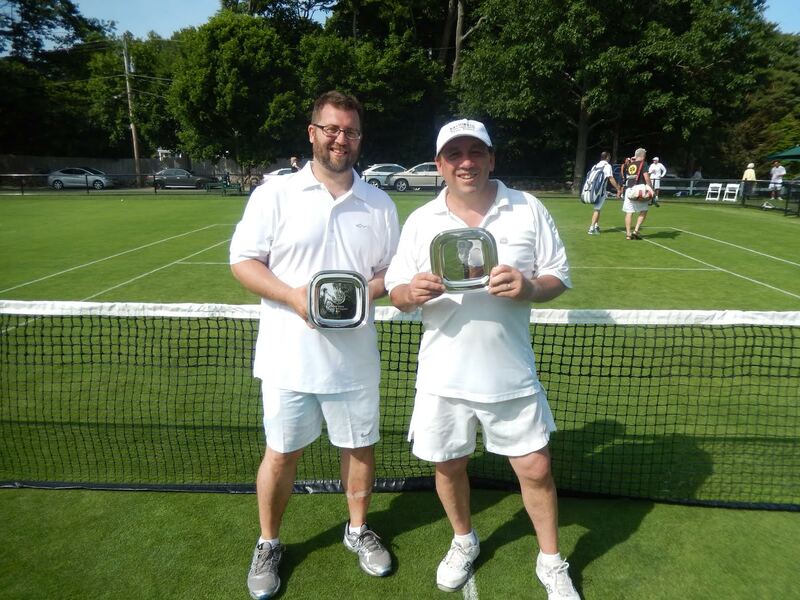 He's plays in TennisNorthEast the Metro Boston Tennis League out of Boston, but recently took a trip to the West Coast and captured the West Coast championship trophy. It's an accomplishment Jeff is proud of and we're happy to see him win. 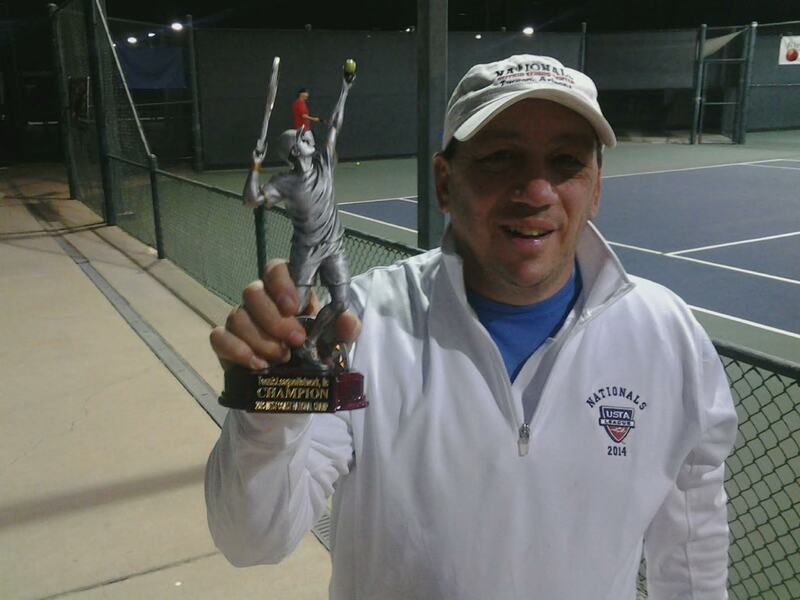 Jeff (Jeff's Profile) has a number of fun stories and memorable matches to share with us. He even has a couple of things to say about Steve Chagnon, Tennis League Network's CEO. We hope you get a kick out of this interview. Thanks Jeff for joining us to answer a few of our questions. We'd like to share your experiences with the league, your passion for the game and more about yourself in general. For starters, when did you first begin playing tennis? I was around it very early in my life as my uncle and his children played and exposed me to it maybe when I was about 7 or 8 years. However, I did not get interested in it and start playing it until my early teens when I started just banging against a brick wall of a high school gym and found a group of people to play with at that same high school's courts. I then got onto my high school team and was hooked. I've been playing on and off (mostly on) throughout my life. As an active player and fan of the game, what do you love about tennis? It suits me...I am fast, like the strategy involved (like being in a chess match), and just enjoy never being able to never be out of a match and have a chance to come back and win. But, I also have loved the social aspect of the game-I have met SO many people playing this great game. Of course, there's endless places to explore in the world where you can play it as well. Which league are you a member of and how long have you been participating in it? I've been a member since it's inception which I think was in 2006. I played for about 3 years and than just got busy with my family and playing tennis in a local league and a summer club where I belong. I played with Steve Chagnon when first he took over this type of league and then exploded the concept of it. However, previously it was run at an extremely basic level in which we just got names on numbers snail mailed to us and there were no different divisions by level, records of results in any manner, hailing local champions, or hosting National Tournaments. Ten years is quite impressive! It's always great to see people join something and stick with it. And how often are you playing, in general and with the league? My playing varies. When I was a kid and had no responsibilities I played daily 4-6 hours a day. Now, if I play 1-2 times a week I count myself lucky. 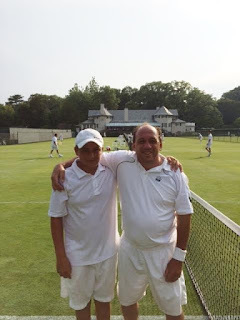 I have numerous tennis involvements between a local club league, a World Team Tennis team of which I am a Captain, having been on multiple teams (and having gone to Nationals twice in 2014! ), playing with my family, and of course Tennis Northeast. As per a lot of tennis people I have met, you could say I'm sort of obsessed. As someone who plays a ton of tennis, what is it about this league that makes it different from others? The flexibility of scheduling matches that suits your own schedule, having players at my level (Tennis League Network has a way of really matching people extremely well by their ability for fun and highly competitive matches), and meeting various new players I would never have had the chance to meet. Since you have so much experience under your belt, can you tell us about your most memorable match(es). I have so many, but I will mention four. Playing in a Father-Son tournament this last summer at Longwood Club in Boston. We got crushed in every match, but just being out their with my son amongst so many phenomenal players was a memory of a lifetime. For Tennis Northeast I played one regular season match in a town far from me and only accessible by one main road. We set our match for 5 pm. Anyway, I got there 15 minutes late due to the traffic. My partner and I agreed to play to a set time. When we reached that time, I had won by games (like 6-4, 4-3). However, he argued that since I was late we should play out the rest of the match. I reluctantly agreed and then went on to lose the match by a game or two. I played a match for the championship of my local division this past fall against a higher ranked and so much younger opponent. I'm 54 and this guy was 26. We played 3 sets in 4 hours! I was happy to take it all in the 3rd set. I just played in a National Tourney in L.A. this past January, 2016 in the 3.5 Level Division. I surprisingly made it to the finals as I had no expectations going in. I played against Darren Smolkin who I thought was the guy to beat. It was a 10 game pro set. I went down quickly 6-1 letting him dictate play. However, I got fired up/inspired by Steve C. who was watching the match and just told me to take "show some balls" as how I usually hit pretty hard. 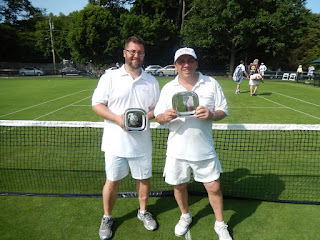 I ultimately started dictating the match and won 10-9 to capture the Championship. 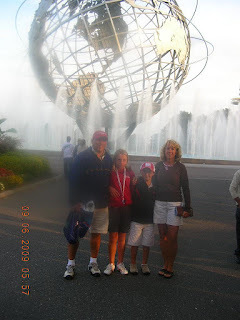 It has been the pinnacle of my amateur tennis "career." Those are some great stories. In addition to those matches, who are your favorite rivals in the league? Why? Believe it or not Steve Chagnon and I have been battling it out ever since I decided to jump back into the league this fall after my 6 year hiatus. We have had several matches go down to the last game or even point. He makes me run and attacks strong at the net which often puts me on my heels. I think I edge him overall in matches won, but before this year he called me his daddy as I owned him. I'm sure Steve is going to ask for a rematch after that! When it comes to pro tennis, who are your favorite pro players? Why? There have been SO many greats over the years. The classics like John McEnroe (who I used to be like with my antics), Jimmy Connors, Steffi Graf, Williams sisters, Andre Agassi, Roger. Basically I really have found the tops at the game to be phenomenal to watch, root for, and learn from. It really is very user friendly with the Website and Tennis League Network is constantly tweaking it to make it fun and competitive for everyone. I wish somehow the mixed doubles could become more popular, but it's great for those who really like singles. Well once again a big thanks for your time. Good luck out on the court this season!